Saint Helena is a small island in the Atlantic Ocean that is a very long way from any continent. It is approximately 1850 km from Africa, and about 3290 km from South America. It is only 16 km by 8 km in size, and the highest peak is 818 m above sea level. It is the place where Napoleon was exiled, and where he lived the last five and a half years of his life. It currently has a population of about 5,000 people, and is a British Overseas Territory. 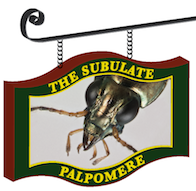 And it is a place with an endemic radiation of extremely odd bembidiine carabids. I have dreamed of going there to collect some for DNA studies, to find out where they belong in the bembidiine evolutionary tree. They are currently classified as genera separate from Bembidion. I’ve looked into traveling to Saint Helena, and it is not a trivial undertaking. There is no airport in Saint Helena (although one is under construction with a scheduled opening in 2016), and the typical route is to fly to Capetown, South Africa, and from there take a Royal Mail Ship to the island, a sea journey of five days (one way). all to the same scale. Scale bar is 1 mm. Some of these simply don’t look like bembidiines. The oddest one isn’t shown here – it is Endosomatium megalops, whose huge head is vastly out of proportion to the rest of its body. This has made me rethink going to Saint Helena, in part because I think more work needs to be done re-establishing the beetles’ forest habitat before any more collecting is attempted. Instead, I have focused my attention on seeing if I can extract and sequence DNA from some of the pinned specimens already in museums. To that end, I borrowed specimens of three species from the Royal Museum for Central Africa in Tervuren, Belgium. I’ve extracted DNA from one of each of these. The DNA from one of them, a Pseudophilochthus nubigena, looks as if it will be of high-enough quality to allow us to obtain sequences using next-generation sequencing. And, in fact, we have PCR products for 500 bases of 28S and 450 bases of the wingless gene. In advance of the next-generation sequencing, we will be sending the PCR products off to be sequenced, and hope to have results within a week. We should have the first information then about where at least that one species falls. 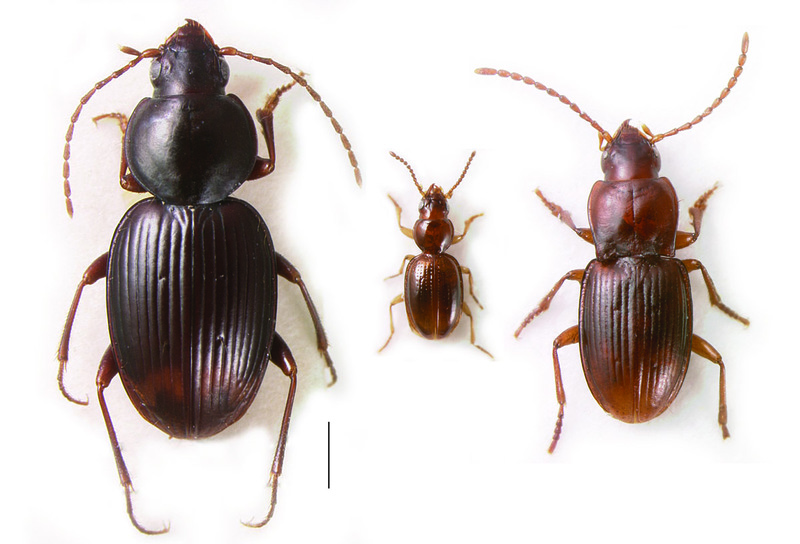 And so, I will make the following prediction: the Saint Helena species are simply highly derived Bembidion, and should not be treated as separate genera. They form a single, endemic clade (to test this, sequences from more than one species will be required). My first guess is that they belong to the Bembidion Series (Maddison 2012), perhaps near the Antiperyphanes Complex of South America or the Ananotaphus Complex of Australia, New Zealand, and Hawaii. My second guess is that they are in the Philochthus Complex. These guesses are based more on gestalt than a careful character analyses; the dominance of the Bembidion Series in the southern hemisphere fauna also sways me. This entry was posted in Tree of Life and tagged Bembidiina, Bembidion, DNA, museum specimens, Saint Helena. Bookmark the permalink. Saint Helena is the dream of all Bembidiologist, and its fauna is very fantastic! I saw the specimens of S. Helena in Tervuren too. I look forward to know the series which they belong. Only a note: the only species not endemics of Saint Helena is B. mellissi, that you cite as B. mixtum. Did you see the specimens of this species? Because the same Netolitzky (1931) said that it is very very similar to B. sperans. I haven’t seen the B. (Omotaphus) from Saint Helena – I was simply basing “B. mixtum” on Basilewsky’s 1972 treatment of the Saint Helena specimens as a subspecies of B. mixtum. This could very easily be incorrect! I remembered well and so I am I checking a specimens of Omotaphus of Saint Helena (“St. Helena 78.12 / Bembidion Mellissi W.”, 1 ♀ imm.! – Museum of London-MNHL). Also it is an immature, I am sure that it’s sperans (or perhaps mellissi b. sp.) and not mixtum. Another (very small) brick in the wall. I agree, I saw long series of B. melissii at Tervuren and I am sure too that they are the same as B. sperans (the oldest name for the taxon). Of course I will give credit, including a link to Your blog, and of course I will not use anything without Your permission.